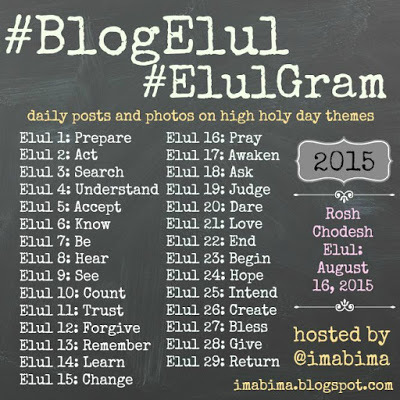 Today is the 5th of Elul, which is one week until I officially become a Member of the Tribe. So today’s theme is “Accept.” Hoo, boy. I’m not sure I even know where to begin. In our class yesterday, we discussed the idea that in order to change, you have to begin by not changing – by accepting who and what you are, where you are, right here, right now. For a lot of people that’s a really tough thing to do. I know it is for me. I’ve been fighting with this – wrestling with it, if you will – for all 44 years of my life. There’s always something preventing me from accepting who and what I am, where I am, right here and now. So I guess I’ll talk about acceptance by talking about that. I’ll be acceptable once I’ve lost 30 pounds. I’ll be acceptable once I can run a marathon. I’ll be acceptable once I can quote the Talmud from memory. I’ll be acceptable once I have that job. But isn’t the truth that God finds you acceptable right now, as you are, even though you’re not perfect? Doesn’t acceptance, at its heart, come down to being okay with not being perfect? Because the truth is, none of us can be perfect, no matter how driven we feel towards perfection. Are you giving 10% of your income in tzedakah? Not yet, but I’m working on it. I gave $20 to a homeless man the other day. Are you keeping kosher? Not completely, but I’m working on it. For example, I no longer eat shellfish. Are you saying all the required brachot and other prayers? Not yet, but I say the Shema every morning and every night. Why are we so unwilling to say “I’m working on it” instead of “I’ve got it done/fixed/handled?” Why are we so prone to demanding completion rather than process? Robert Merton, in his theory of institutional anomie, said that the American society is far too focused on the goals and not nearly enough on the means of achieving those goals (aka the process). Is it a human condition to focus on the goal rather than the process? Or is it simply a condition that we’ve created for ourselves in this hectic world where you don’t eat unless you have a paycheck? It might seem that I’ve strayed far afield from the idea of “accept,” but I haven’t, really. Because all this is, is accepting where we are, right now, isn’t it? It’s accepting that a goal is not the be-all and end-all, that process is the real thing, and that being 1% better than you were yesterday could mean a 365% improvement in a year, if you did it every day. But to do that, you have to accept where you are as the starting point. Where are you today? Right here, right now, what do you need to accept in order to move forward? Look down at the starting line. That’s where you are, right here, right now. The finish line will wait for you.